Commencement speaker and Governor of Pennsylvania Tom Wolf delivers the 2016 Commencement address. Photo by Carl Socolow '77. 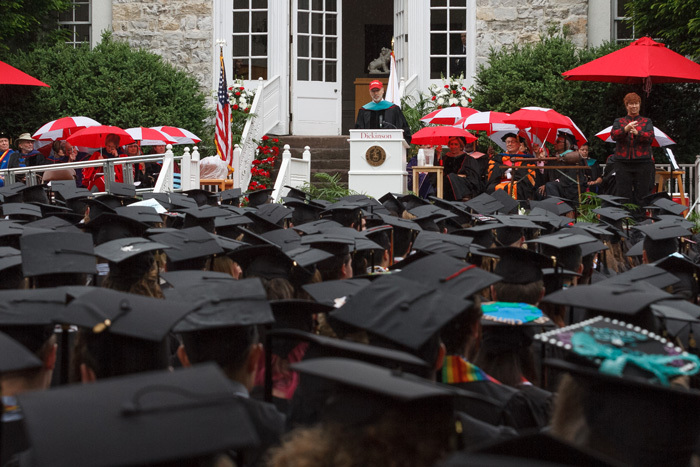 Five-hundred and twenty-seven students became graduates of Dickinson on Sunday, May 22, during Commencement, which marked the official end of the 2015-16 academic year. In addition to the presentation of student and faculty awards as well as the bestowing of three honorary degrees, the ceremony featured advice from Commencement speaker and Governor of Pennsylvania Tom Wolf, who encouraged students to balance individual success with social responsibility. Despite gray skies and a slight drizzle throughout the ceremony, Wolf assured graduates that a bright future lies ahead of them if they understand that blazing their own paths should not be opposed to strengthening the communities to which they belong. A student takes a moment to embrace Joyce Bylander, vice president and dean of student life, before making the ceremonial walk down the steps of Old West. Photo by Carl Socolow '77. College President Nancy A. Roseman opened the ceremony by recognizing retiring faculty, a tradition she started last year. This year there was only one retiree, William Bellinger, professor of economics, whom Roseman recognized for 35 years of service. John Dinsmore (international business & management), president of the class of 2016, announced Suman Ambwani, associate professor of psychology, as the winner of the Constance and Rose Ganoe Memorial Award for Inspirational Teaching. Awarded annually, the honor is determined by a secret-ballot vote conducted by members of the graduating class. Kyle Liss (physics, mathematics) earned the James Fowler Rusling Prize for scholarly achievement and will be attending the University of Maryland to pursue a master’s degree in applied mathematics. Tucker Mitchell (psychology) and Olivia Calcaterra (French & Francophone studies) earned the John Patton Prize for High Scholastic Standing. Mitchell will work as a research analyst at MaPS/Millward Brown Analytics in Boston. Calcaterra will travel to France in the fall to serve in the Teaching Assistant Program. This summer she will work with a faculty member on a summer literacy program for migrant and English-language learning youth in the Carlisle area. Ian Hower (law & policy) and Jiyeong “Faith” Park (self-developed major) earned the Hufstader Senior Prizes, which are awarded each year to the senior man and senior woman who have made the greatest contributions to the good of the college. Hower, who served as the president of Dickinson’s Student Senate, will pursue a master’s degree in philosophy and public policy at the London School of Economics. Park has accepted a fellowship with Princeton in Africa and will work at a Population Service International office in Johannesburg, South Africa. During each Commencement since 2011, Dickinson’s Board of Trustees has chosen a Young Alumni Trustee from among nominated seniors to represent young alumni on the board. This year Ethan Andrews (economics) was selected and will serve a two-year term. Students move their tassels from the right to the left as they become graduates. Photo by Carl Socolow '77. David Satcher, former U.S. surgeon general, assistant secretary for health in the Department of Health and Human Services and director of the Centers for Disease Control, received a Doctor of Public Health degree. Elaine Livas ’83, the founding director of Project SHARE, which has been serving the poor of the Carlisle area since 1984, also received Doctor of Public Service honorary degree. The Sam Rose ’58 and Julie Walters Prize at Dickinson College for Global Environmental Activism was presented to Pulitzer Prize winning writer Elizabeth Kolbert. The prize recognizes Kolbert’s work as an author and journalist who has helped explain global warming and its impacts in such books as The Sixth Extinction and Field Notes from a Catastrophe: Man, Nature, and Climate Change. Kolbert, who will visit Dickinson for a short residency in the fall, was unable to attend the ceremony because she was at her son’s college graduation. However, she prepared a statement for the class, which was read by Neil Leary, the director of Dickinson’s Center for Sustainability Education. Much like Wolf, Kolbert urged students to remember their larger obligation to the world around them as they set out on the path toward the future.